It’s beginning to look a lot like you-know-what. And so, on this day, I am crowning Nashville’s king and queen of Christmas 2016. 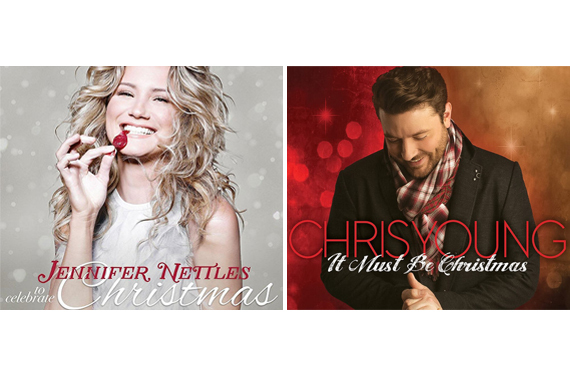 They are Chris Young and Jennifer Nettles, who have this year’s finest new Music Row holiday albums. They sing their faces off on It Must Be Christmas and To Celebrate Christmas, respectively. Buy them both, and your tree trimming party will be a smash. Those two share the Disc of the Day award. Because we have no newcomers here, there is no DisCovery Award this week. – Christmas Together is the first duet album by Garth and Trisha. It is a Target exclusive. While he has his moments on it (”Ugly Christmas Sweater”), her solo performances steal the show. She brings just the right kittenish, mercenary purr to this perennially entertaining delight. “Hard Candy Christmas” and “What Are You Doing New Year’s Eve” are also Trisha standouts. He has a duet with James Taylor on a Thanksgiving tune. – A Very Kacey Christmas is a blast from start to finish. Where else can you find cha-cha, reggae, western-swing and Hawaiian arrangements on one holiday collection? Her star collaborators include Leon Bridges (”Present Without a Bow”), Willie Nelson (the weed-themed “A Willie Nice Christmas”) and, most notably The Quebe Sisters on this Hawaiian tune as well as on “Let It Snow.” Heartily recommended. Writers: Frank Loesser; Producers: Jay Newland/Rob Mounsey; Publisher: Frank, ASCAP; Warner Bros.
– Brett went to New York to record his Glow holiday collection, which is full of brassy, old-school pop charts. His imitation of Harry Connick Jr. is spot-on in the vocal department. So if that’s what you’re looking for this season, climb aboard. But if you are seeking a country Christmas album by a country singer, this is not it. Also, he and Trainor both lack the wit and wink that should be in this performance. – Reba’s My Kind of Christmas is a Cracker Barrel exclusive. This collection throws you a bit of a curve ball. There is no band. It is just a singer and a pianist. And, surprise, it works. When the singer is as ornamented as Reba and the piano player is as creative and inventive as Catherine Marx, you enjoy every note. It starts with this standard and adds 10 more very, very familiar tunes. – Chris’s It Must Be Christmas is THE essential holiday country collection to own this year. Boyz II Men join him on “Silent Night.” Brad Paisley duets on “The First Noel.” Alan Jackson is his partner on this modern Nashville Christmas classic, which I never tire of hearing. Other stunners include a fantastic new seasonal song called “Under the Weather” and a ferociously rocking treatment of “Christmas (Baby Please Come Home).” This man is a singer’s singer, and you need this music in your life. What a gift. – Jennifer’s To Celebrate Christmas is a triumph. This lady inhabits the holiday repertoire like few others can. She totally rocks “Go Tell It On the Mountain,” offers a completely unexpected delight with “Celebrate Me Home” and brings fellow vocal goddess Andra Day along with her on “God Rest Ye Merry Gentlemen.” Whether it’s “Do You Hear What I Hear,” “Circle of Love” or “Count Your Blessings Instead of Sheep,” these are performances that will pin your ears back. She doesn’t really have the pipes for “O Holy Night,” but more than makes up for that misstep via this collaboration with Idina Menzel. It is, simply, the best version of this standard ever. – I’m all for creative arrangements. But here and in several other places on the CD The Greatest Gift of All, the group takes leave of traditional melody and goes off into aural parts unknown. At a slender 10 tracks, this is the briefest of this year’s Nashville holiday offerings. – Judging by my informal survey of local retailers, Amy’s new Christmas album is the hit of the season. It seems to be sold out everywhere and is hard to find. With reason: Tennessee Christmas is a lovely record. The arrangements twinkle like holiday lights. Her vocals are luminous. The repertoire is a wintery wonderland. One nice touch is the fact that she interjects spoken-word passages about her fondest holiday memories. – File this one under “arty.” Selah is a CCM vocal trio with a penchant for elaborately arranged performances. No one is a hair-raising singer, but when they combine their voices, magic happens. Dolly Parton guests on her own tune “Once Upon a Christmas,” pop singer Plumb drops by for “Mary Sweet Mary” and the Annie Moses Band appears on a medley. This title tune is typical of the CD’s tone. The record gets bonus points for being dominated by newer songs, rather than standards. It is also l-o-n-n-n-ng, at 15 tracks.